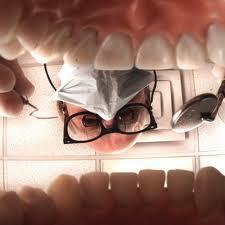 Rethinking Faith and Church: of Dentists and the Call of God. Lately I've been wondering if God isn't calling again. He's done that a few times before in my life. He called me from my old life to a new life in His Son. He called me to uproot my family and my job and my security, and to trust Him in moving to a different province, with no job to go to and no income, and to go to Bible School and then on to Seminary. Time and again, He provided each step of the way. Why am I still so surprised if He is calling again? I remember the time, just after we arrived in the new city, I had need of emergency dental work. I had no job, no insurance, and no way of paying for it. There simply wasn't two spare nickels to rub together! I opened the Yellow Pages, and called the first dentist I saw that was reasonably close to us. He took me in and repaired the tooth. All the while he was working on the tooth, I wondered how on earth I was supposed to pay for it. I had made up my mind that I was going to simply have to write him a check, and deal with the consequences of it bouncing as an NSF check later. Upon completion of the dental work, I pulled out my checkbook only to hear the dentist say to me these words that I've never forgotten: "No charge! Consider it a gift from heaven." My jaw dropped. Did I hear that right? This dentist didn't know me nor know of my circumstances. No charge? Obviously he was a believer and obviously he was a man who was in tune to the leading of the Holy Spirit! What I learned from that experience is that, when God calls, don't sweat the circumstances. If He really did call you, then He will also provide the means. He knows the needs and there is no need for us to announce our needs to others. It is wonderful to simply walk in the faith of obedience to the call and do so in silence. What better way to put out your fleece than to say nothing to anyone and watch and see how God provides. Maybe that is why I have such a hard time with the seemingly constant begging for money from many a pulpit. If God is truly in it, whatever the "it" is, His servants won't have to ask for a nickel. He will lay it on the hearts of others who faithfully serve Him and more than enough will be gathered in to meet the need. There's an interesting story told of how the "people were restrained from bringing" more because there was already more than enough to meet the need (Exodus 36:6). Ever hear the treasurer make a recommendation to the pastor to restrain the people from bringing more offerings? No, me neither. The point is, when God calls to a listening people, there will always be enough. Nobody needs to be encouraged, unless, of course, God really isn't in that "ministry." In that case, they will always have to preach for more money. But I've digressed. After Seminary, God led into the pastoral ministry for a season. Then, interestingly enough, He called out of it just as surely as I sensed His original call into ministry. However, I quickly learned that God isn't subject to man's little ideas of what does and doesn't constitute the call of God. He is so much greater than all we've ever imagined. Suddenly I found myself fellowshipping in homes, restaurants and parks. Basically wherever and whenever the Spirit lead. The gathering of the saints wasn't just for a quick hour or two on Sunday morning anymore. Some weeks saw some measure of fellowship every day. It truly was incredible. Today there seems to be a lot more discussion on the pros and cons of the house church. We now even have other fancy names such as "simple church" and "organic church." Sometimes I do tend to wonder if there is much of a difference at all between these new fangled ways of gathering the body in comparison to the institutional systems from which they came. Sometimes they look and act simply like a smaller version of the larger institution, albeit in a private home. Don't get me wrong; I'm not judging it one way or another. I'm simply making a personal observation. As I said at the beginning, however, I now am wondering if God isn't still leading me in yet another direction. What direction you may be asking? To be honest, I'm not sure yet. All I know for sure is, He has called before. All I know for sure is, His previous calls have always been accompanied with His provision. What will the test of this call be? What fleece have I put out to confirm the call? It is simply this: "Lord, place exactly the same call on my wife, whatever that call may be. Lead her as you are leading me." That is the test. I do not believe that God calls the husband without also calling the wife. If He designed the two to be one flesh, then in my way of thinking, that requires the same call. He won't send one to China and the other to Brazil. The exciting thing for me now is to wait and see the leading of the Lord. To that end, I covet your prayers.